Yes, enjoy. last season we had a chance, but we messed it up, and this year looks even better. There is no Mercs dominance anymore. Yeah it will better today but a second is too much, with a clean lap in Canada, Hamilton would be on pole by at least 3 tenths and now with the ominously powerful Spec 2.1 + power track + thinner tyres, Hamilton could be on pole by at least half a second. Hoping Vettel has a good start so he can have a tow going into turn 1 to lead the race. WHAT ON EARTH ARE YOU TALKING ABOUT ???????!!!!!! You are seeing 1 sector time and you make conclusions??!!!! Do u need to remind you Spain last year??? Vet was 0,5 s!!! down after sector 2,and he end up losing the pole!!!!!! And Vet make a mistake and this you can see it in the fastest tume table,where he was almost 2 tenths down to Bottas!!!!! So Merc boy please stop it because it becoming truly annoying!!!! Vettel was 0.5s down after Sector 2 in Spain 2017? You obviously didn't watch that qualifying session because Vettel had set the fastest first 2 sectors of anybody in Q3 but then made mistake in Sector 3 chicane which cost him pole. Since when I became a Mercedes fanboy? I want Mercedes to lose and Vettel to win. No he didnt do ANY mistake!!! It was just that Ham had that so much better sector 3 (over 0,5s).Vet never had better S3 all weekend. Just like Ham in Canada. To do a good sector doesn't mean that he would do all the others too!!! And all your posts are only to praise whatever Merc have done, doing and rumours say they will do.And then downplays whatever Ferrari are doing!! To me yes this is the definition of a Merc fan!!! Dark clouds approaching.....40% chance of rain today and tomorrow. Last edited by jgonzalesm6; 23rd June 2018 at 10:54. This will ruin ferrari programme very much than other teams. Yep. This rain is disastrous for Ferrari. They use Saturday to confirm setup changes from the simulator. Now they can't do that. Yikes. 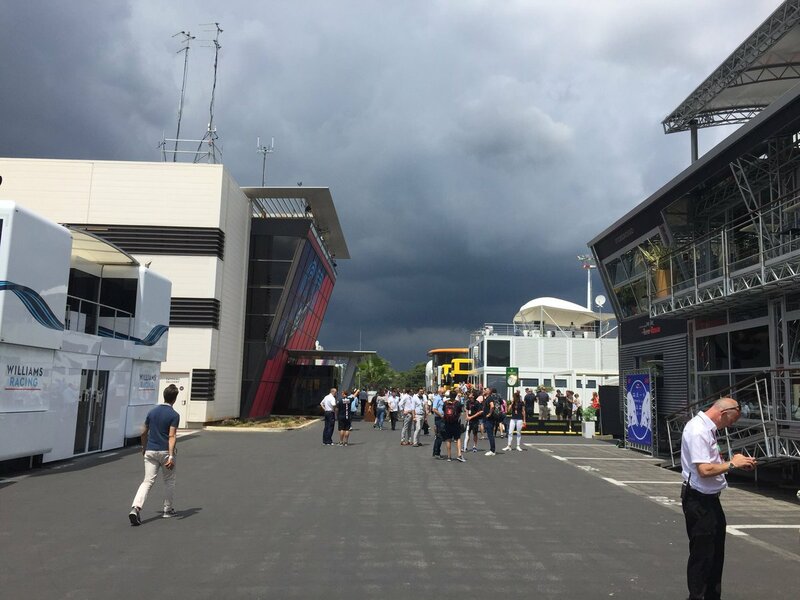 Ross Brawn did say that they are expecting thunder storm to quali and race. So betting Mad Max as a winner is maybe a good idea. If rain is on, fight will be between Hamilton & mad max. That’s it. Have some faith in red. Wets will get more track time than the hard compound tyres for 2018. Stupid rule on wet tyres for Friday but not Saturday....jeeezus. And no one goes out, hardly, because they don't want to ruin their sets come quali and race day.....pathetic. I want see Ferrari dominate in wet conditions.... it’s been a while. What baffles me is, ferrari have strong chassis & good in dry conditions but they are unable to switch it on wets. Well what else can you expect from FIA and their stupid rules? Well we haven't really seen what the chassis can do this year in the wet. Let's wait until quali to make any assumptions. More rain expected at quali ??? Any experts ? Mercedes went for more downforce in Sector 3 which is why not just Hamilton but Bottas too had 2nd best time in that sector. And Canada - Hamilton never really faced any competition, driven Mercedes powered cars all his life so has good records on that power track, the only time he had a competitive teammate was Rosberg and he lost once. This time around, things were close and he again was beaten in qualifying, this time embarassingly by his own teammate. You look like a massive Hamilton fan but I have to say this to you: Hamilton ain't as good as you think he is. 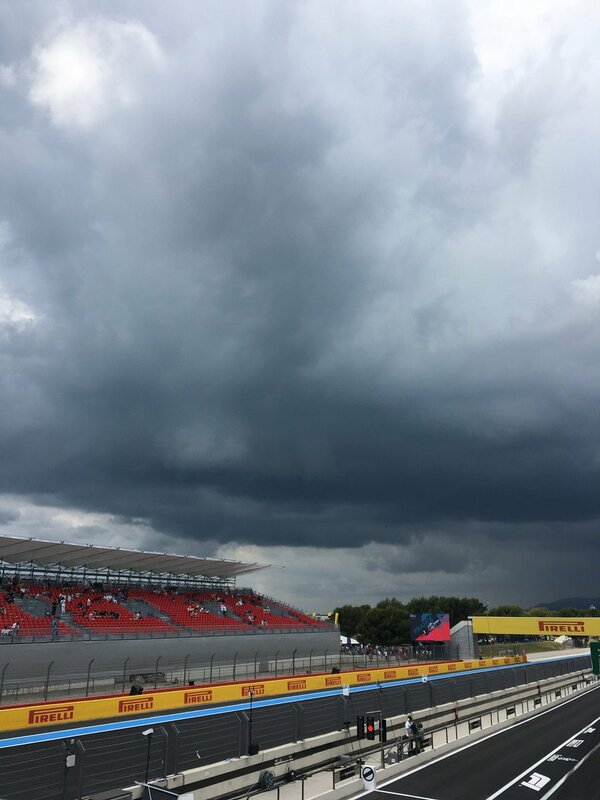 According to Ross Brawn, thunderstorm expected at the middle of quali. Love the wet, equalizes the playing feel and seperates the talented from the not so talented.....and/or the stupid who take out one or others. Even if it equalizes the field. Ferrari doesn’t stand good chance in the wet. How did stroll out quali us in the wet, you’be seen it right. Sunshine poking thru now, hoping for a dry quali. Brundle thinks Merc is stronger this weekend, I hope Vettel proves him wrong come Q3. You know abt Martin Brundle, he’s just like mr. Horner. Who thinks RB is stronger, after fp1’s & fp2’s...! !